Not only has Templar won himself an iPod Shuffle but his logo will also be digitised and used on all of our promotional materials and outputs! Well done Templar and watch this space for the new logo design! Because the standard of entries was so high we also decided to name some runners up. These were Callie-Mai Hind (10), Caleb-Gerald Ward (7) and Elliot-James Lutton (4), siblings, from Ermine Primary. They produced the image below which really captured the spirit of our project, which is all about giving children a voice about their city and providing them a platform from which they can be heard. The family have won tickets to attend an Imps fixture of their choice – well done!! All of the competition entries, including our new logo, will be showcased at our launch event on Saturday 4th November 2017. If you are in Lincoln, please pop down to the Isaac Newton Building on the University of Lincoln campus between 10am and 4pm to find out more about our work and to enjoy some crafts and activities! All families welcome! 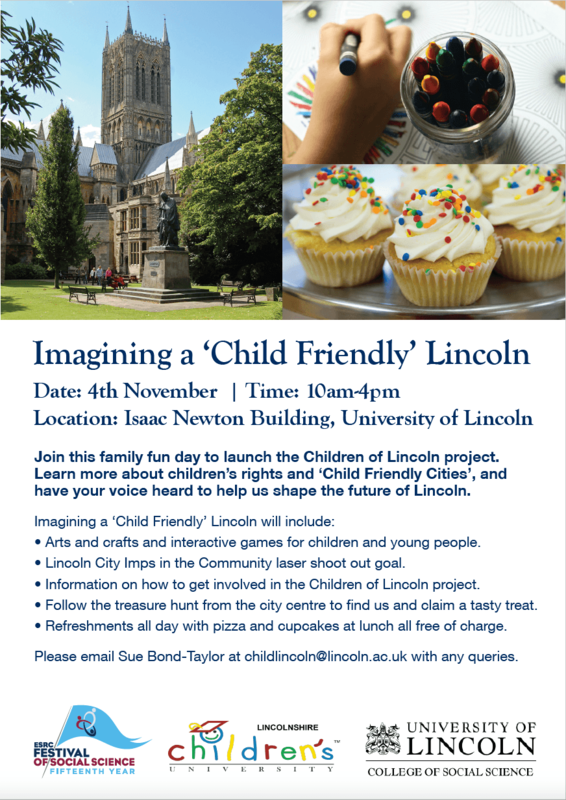 We would like to invite everyone to join us on 4th November as we launch the Children of Lincoln project, and start a conversation about what a ‘child friendly’ Lincoln could look like. Lots of free activities for kids, with complimentary refreshments all day and pizza and cupcakes provided for lunch!! Thank you to all the children who sent us their designs for a logo to represent the Children of Lincoln project. The competition is now closed and we will be announcing our winner very soon! Do you go to school in Lincoln? We have an exciting opportunity for the children of Lincoln to design a logo for our new project! This is also a chance to win an iPod shuffle or tickets to see the Imps! Researchers at the University of Lincoln have been working with City of Lincoln Council and Lincolnshire County Council to launch a child rights initiative for the city of Lincoln. Our aim is to gain recognition as a UNICEF We have asked local children to decide on our name and we now need a logo! Submissions are welcomed by both individuals and family groups. The deadline for competition entries is Friday 13th October 2017. As well as winning a prize, the winning logo will be featured on all of our project related materials. The official launch of the project name and logo will take place on Saturday 4th November 2017 at the University of Lincoln. We will be holding a fun day of activities to celebrate, and share information about the project. Everyone is invited! You can download the Logo competition advert2 here. Please note that the entry form should be printed off in A4 size and the logo should fit within the 10cm x 10 cm square provided. Our new official name is Children of Lincoln! We now need a logo and are currently running a competition for children who attend schools in Lincoln. If you’d like to take part you can find out more here.